I’m one of the millions of people who love their dog more than almost any human. Because my dog, Jewel, is like my child, I’d do almost anything to make her happy and to keep her healthy. I want to ensure her proper digestion, immune health, dental health, and I want to keep her skin, eyes and ears clean and healthy, as well. With the array of products on line and in stores, all promising healthy, high-quality options, which ones are truly the best for your pet? I’m sure you would agree that keeping your pet healthy on both the inside and the outside is of equal importance. However, out of all the products in the marketplace today, most do not include the single most important contributing factor to your pet’s health. It’s something that’s probably not even on your radar – beneficial bacterial microbes better known as probiotics. Probiotics are most likely more familiar to you because of yogurts, probiotic drinks like kefir and kombucha, and digestive supplements. The probiotics in these products address internal digestion, which is one key to better health, but, as I said before, I want to keep my pet well internally and externally. I also mentioned that probiotics are the single most important factor for your pet’s health regime. 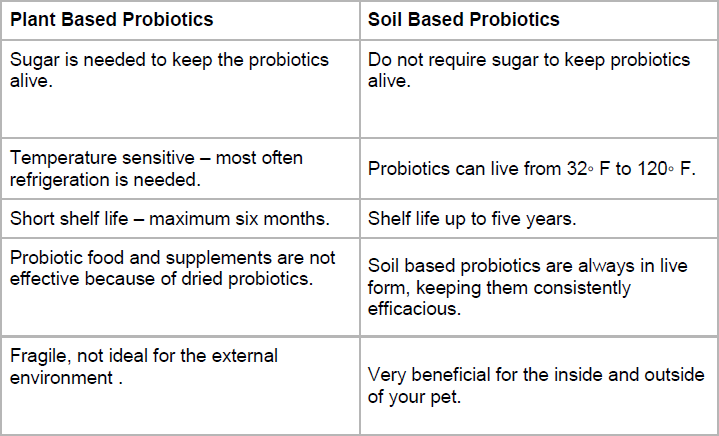 But, all probiotics are not equal in efficacy, so it’s important to understand how to make good product choices when choosing probiotics options for your pet. First, you need to understand why probiotics are so important. Digestive problems, skin issues, and allergies are on the rise amongst household pets. I speak with a lot of people who tell me that they’ve found their dog or cat continually gnawing at the same spot on their body; they’ve noticed bloody, and sometimes infected, patches on their skin. To combat the infection, their pet is prescribed an endless cycle of antibiotics, which we now know is not a good solution for you or your pet. When antibiotics are used, the good and the bad bacteria are eliminated. After antibiotics, it can actually take up to six months for these good microbes (probiotics) to replenish. Without good bacteria to keep them in check, the bad bacteria are free to frolic and to cause further health issues. This is why infusing good bacteria into your pet’s body is paramount. Even if your pet isn’t experiencing health problems, and you just want to keep Fido or Fifi healthy, incorporating good bacteria into the digestive system on a daily basis is a good idea. But, how do you do this? The answer is not as simple as you’d think. While many dog foods have probiotics, they end up dried and processed during manufacturing. The chance of these probiotics making it through your pet’s bile system and having a positive effect on digestion is negligible. While you can give your pets probiotic supplements and probiotic treats, they may be just as ineffective as probiotic pet food. The easiest way to get good microbes into your loving pet’s digestive system is to use a liquid form of probiotics. To take this a step further, I recommend a probiotic water additive that is easily added to your pet’s water. As an alternative to an additive that has plant based probiotics, I use one that incorporates a different kind of probiotics: soil based probiotics. Plant-based probiotics are much easier to incorporate into a variety of products, which is why they’re used most often. Soil based probiotics are rarely found in products because they can come alive and lose efficacy without the proper stabilization. The best option is to find products that keep the soil based probiotics in a dormant state until you are ready to use the product. The optimal soil based probiotics will not require refrigeration and will have a long shelf life. If it were easy for companies to use soil based probiotics, they would because they truly are the most effective probiotics available today. As you can see from this chart, the benefits of soil based probiotics far outweigh those of plant based probiotics. This is even more evident when looking at the impact of soil based probiotics on livestock. Your home is obviously not a barn full of livestock, but you do have up to 7,500 different species of germs living on the surfaces you touch in your home and with which your pet comes in contact . This is why the outside of your pet is just as important as the inside, bacterially speaking. Probiotics should be applied to your pet’s coat, in their ears and up their nose (yes, up the nose. ), as well as internally. In fact, a friend of mine, Linda Cobb, the Queen of Clean, applies probiotics every day to her cat, Finn. Until probiotics entered his world, he experienced major skin and digestive issues and was on an endless cycle of antibiotics. When she was away for a few days, the sitter didn’t spray the probiotics on Finn or put them in his drinking water, and he got sick. When Linda returned home, she knew immediately what was wrong. As soon as she started to use the probiotics again, Finn returned to his happy, healthy self. Oh, and the litter box? Linda sprays it every day, and you wouldn’t even know a cat lives in her house. Incorporating good bacteria into your pet’s wellness regime, internally and externally, is crucial for your pet’s health. Even with all of the product choices available today, your pet will benefit the most from a probiotic water additive, cleanser and spray that is soil based. Be Well and Be Healthy.